We've known that the moon is dead since Apollo. But what if something lay dormant in the dust, waiting to be found? In 2028, Mark Noble is conducting a survey of a moon crater. The entity secretly grabs a ride back to Moonbase on Mark's buggy. Once in the habitat, it begins to infect the crew. They find themselves in a frightening, helter-skelter adventure with only two possible outcomes: losing or saving the Earth. Moonscape is the latest hard science fiction story from Tony Harmsworth, a First Contact specialist who writes in the style of the old masters. 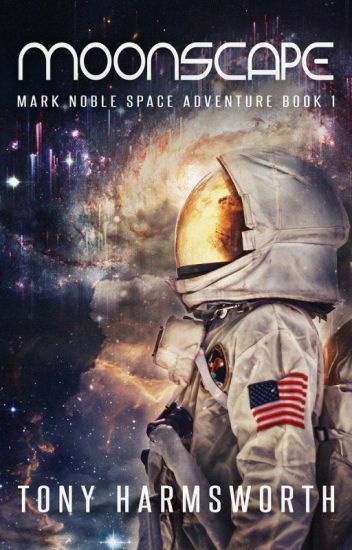 If you like fast-paced adventure, fraught with the additional dangers found in space, then Tony's latest tale has been written especially for you. Explore the page-turning world of Moonscape today! 25 And Then There Were Two! It is always very difficult to debunk conspiracy theories because the claims made by the conspiracists need no justification at all and are often based on an actual ignorance of the science. Debunking their claims requires an understanding of basic scientific procedure at the very least, the exact knowledge they lack, and this, in turn, causes an irrational refusal to believe what they are being told. Because of the Internet, they are often extremely well informed, but also completely wrong. Henry Mackay and his dog regularly walk alongside an ancient convent wall. Today, as he passes the green door, he glances at its peeling paint. Moments later he stops dead in his tracks. He returns to the spot, and all he sees is an ivy-covered wall. The door has vanished! He unwittingly embarks on an exciting trail of events with twists, turns, quantum entanglement and temporal anomalies. It becomes an unbelievable adventure to save humanity. Green Door is the latest science fiction mystery from the pen of Tony Harmsworth, the First Contact specialist who writes in the style of the old masters. Discover the secrets being hidden behind the Green Door today! (C) 2016/7 Tony Harmsworth - All Rights Reserved. For the avoidance of doubt, anyone using this storyline, characters or copying prose or dialogue without written permission, will be prosecuted under international intellectual property laws. MINDSLIP is the catastrophe which hits the Earth at 8.15am GMT next Wednesday morning. It began six hundred and fifty years earlier when Betelgeuse fulfilled its long-held prophecy to turn supernova. The radiation, gamma rays and gravitational waves hit the Earth at the same time as a coronal mass ejection. The combined bombardment causes all creatures on the Earth to swap minds, leaving people in animals, animals in people, men in women and children in adults. The nightmare which follows becomes a social and economic catastrophe. Geoffrey Arnold becomes a key figure in the government catastrophe committee, formed to resolve the myriad issues raised by MINDSLIP. Power generation, the health service, farming, pay, pensions, education, the banking system and asset ownership spiral into chaos. In addition, Geoffrey must save his wife from an imminent premature death brought on by one of the MINDSLIP effects. MINDSLIP is a realistic, frightening and sometimes amusing work of imagination which explores how people and families react to the world being changed beyond recognition. Note: MINDSLIP had been acquired by a publisher who, regrettably, has now folded. Rather than put the original version up on Wattpad, I have decided to give it a considerable edit. I'd love to know what you think. The early chapters might disturb, but hopefully they will also make you think about how you would deal with Geoff, Andrea, Angus, Caroline or Allan's situations. Use the comments to tell me what you would have done? (C) 2017 Tony Harmsworth - All Rights Reserved. For the avoidance of doubt, anyone using this storyline, characters or copying prose or dialogue without written permission, will be prosecuted under international intellectual property laws. If you wish to write fan fiction based on my work, please seek written permission. Understanding what is happening in space research is no longer a matter of watching  a documentary once a year, or reading the odd abridged article in a newspaper. It requires a comprehensive knowledge of all things NASA, ESA, Roscosmos and the work going on in universities around the world. I have tried to keep up to date and thought the subject of going to Mars needed some simplified explanation. I have tried to do that here. This light-hearted sci-fi novel covers the misadventures of an out-of-work life support systems engineer on his way back to Earth and a reporter desperately in need of a scoop to save her career. He needs to get back before the reading of a will. She needs a breakthrough in her story before her time limit is up. With each other's help getting back to Earth in time should be possible but life certainly isn't about to make it that simple for them. An alien intruder, a rogue robot, space pirates and government agents are just some of the obstacles conspiring against them. Please, please, please don't forget to vote if you enjoy this story! And if you don't want to vote, please comment. It's great to find out what people think of my work. This novel will definitely be completed as I have already written the whole thing from start to finish. Specialist astronaut Evelyn Slater encounters a small, badly damaged, ancient alien artefact on the first ever space-junk elimination mission. Where was it from? Who'd sent it? International governments impose a security clampdown. Evelyn leads a team of hand-picked scientists who make amazing discoveries within the alien device. Secrecy is impossible to maintain. When the news is finally released, she becomes embroiled in international politics, worldwide xenophobic hatred and violence. This is book one of Tony Harmsworth's First Contact series of novels. If you like realistic near-future stories which compel you to imagine yourself as the protagonist, The Visitor is the book for you. The Visitor - hard science fiction with a wicked twist. Read it today. (C) 2017 Tony Harmsworth - All Rights Reserved. For the avoidance of doubt, anyone using this storyline, characters or copying prose or dialogue without written permission, will be prosecuted under international intellectual property laws. If you wish to write fan fiction based on the characters or invented worlds in my work, please seek written permission.